Happy Bride on her Rainy Wedding Day! I'm often told by my couples that they love how I make the most of their day to give them the best wedding photographs possible. This bride enjoyed her rain-soaked wedding day! I know as a bride you want a day that’s perfect in every way, including the weather. But, one of my favorite wedding photos was taken on this rain-soaked afternoon. 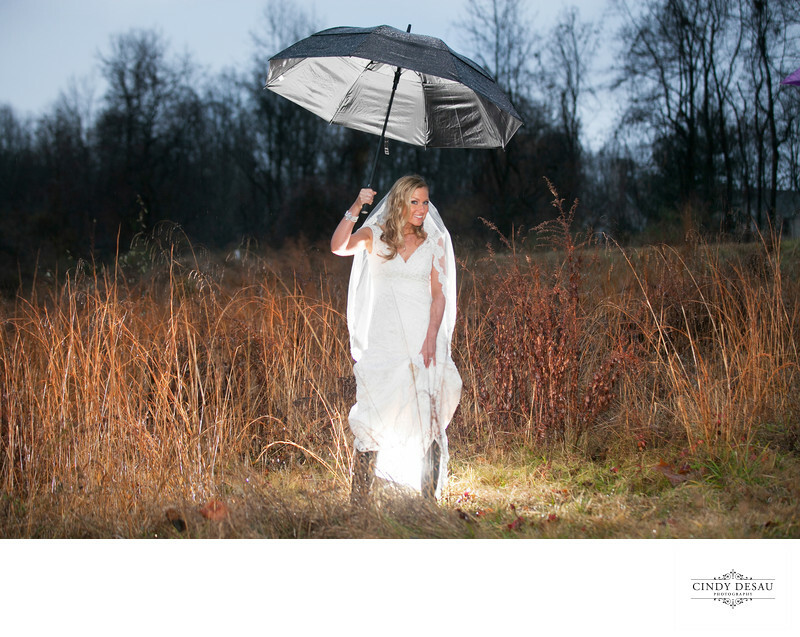 This bride was not going to let the weather deter her from a fun photo shoot. And neither was I! I suggested some interesting photo props for the rain and she came prepared with the black rain boots and matching black umbrella. I put lighting behind her to make her “pop” from the darker background of the blue rainy skies. I think the brightness of her smile and her happy expression as she poses in this Bucks County wet field makes a gorgeous and unique portrait.I like to give my couples a fun experience no matter the weather. The weather becomes part of your personal wedding experience, so embrace it, and let me weave it into your photo story on your wedding day.